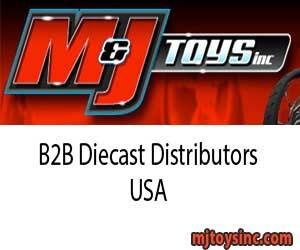 M & J Toys is a B2B Diecast Distributor of Collectables Diecast Wholesale Cars USA / CA Los Angeles . B2B Diecast WholeSale scale model cars. Click on the category links on the left to browse our large collection of Wholesaler Diecast Model Cars or click here for our Pre - Order and New Arrival Scale Diecast Model Cars. MJ Toys wholesales collectable diecast cars. We carry the largest selection of diecast model car manufacture brands: Maisto, Burago, Jada Toys, New Ray, Hotwheels, Greenlight, Kyosho, Auto Art, Greenlight, Norev, Highway 61, Minichamps, Motor Max, Mondo Motors, Auto World, ERTL, M2 Machines, Sun Star, Sunny Side, Welly, BBR Models, Biante, Boley, Case IH, CSM Models, Daron, First Gear, Gear Box, GMP, Guiloy, Jadi, Johnny Lightning, Kinsmart, Liberty Classics, Luxury Diecast, Motor City Classics, Motor Head Miniatures, Muscle Machines, Norscot, Phoenix Mint, Revell, Road Signatures, Schuco, Shelby Collectibles, and Signature Models. Each manufacturer makes certain types of vehicles. We carry Ferrari, Lamborghini, Pagani, Bugatti, Ford, Chevrolet, Dodge, Aston Martin, Audi, Bentley, BMW, Buick, Cadillac, Chrysler, DeLorean, Ducati, Fiat, GMC, Harley Davidson, Honda, Hummer, Hyundai, Infiniti, Jaguar, Jeep, John Deere, Kawasaki, Kenworth, Koenigsegg, KTM, Lancia, Land Rover, Lexus, Lincoln, Lotus, Maserati, Maybach, Mazda, Mercedes-Benz, Mercury, Mini, Morris Minor, Nissan, Oldsmobile, Opel, Packard, Peterbilt, Peugeot, Plymouth, Pontiac, Porsche, Renault, Rolls Royce, Saleen, Saturn, Scion, and Shelby. These diecast collectable cars come in many sizes or scales. The different scales we have for diecast cars are 1:12, 1:18, 1:24, 1:32, 1:43, 1:64 and 1:87. We have cars from the beginning of the automobile industry all the way to the vehicles of today. These cars are made with diecast metal and finished off with details reflecting the real cars. Most of the collectable diecast cars are licensed by the car company so the details will match in nearly every aspect. Quality of craftsmanship varies from each different brand. There are lower quality cars and then there are the perfectionist’s collectable cars that are cheaper and expensive, respectively. The Collectable diecast cars usually come in either a display tray or a window box. For the display tray, there are multiple cars in one box and usually they are an assortment of colors. The window box has each individual diecast car in its own box with a clear plastic to display its beauty. Besides diecast collectable cars, we also sell RC (radio control) cars and other toys. The scales for RC cars are 1:10, 1:14, and 1:20. The RC cars are also licensed by the car maker and some of them are generic non-licensed custom cars. Some of the RC cars are Ready-To-Run, which means that the batteries are included. We sell to retail stores, distributors, and individual sellers who have their own online business around the world.